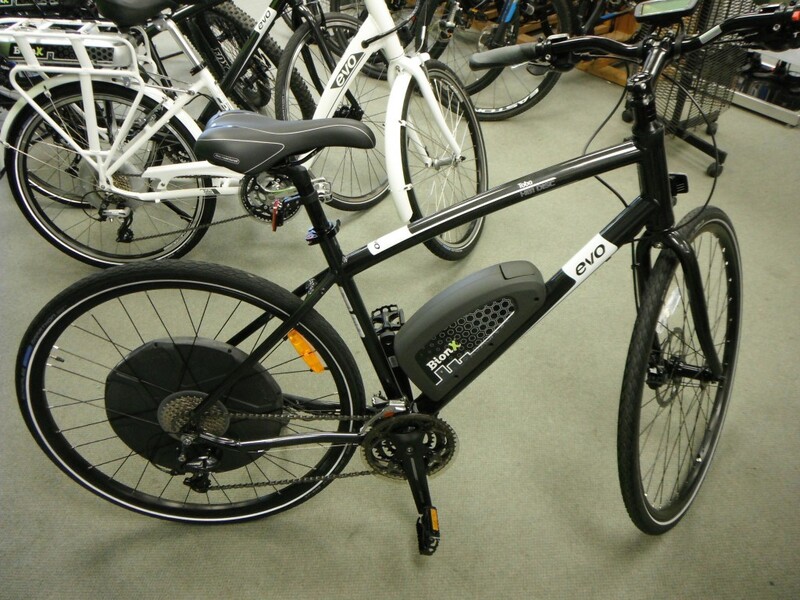 Lightweight, long range ebike with hydraulic disc brakes and 27 speed Shimano drivetrain. Perfect for commuting, errand running, or just getting around. Initial impression is that this is a very quick, comfortable easy to ride bike. And it is. At 47.5 pounds it is lighter that most other ebikes too. 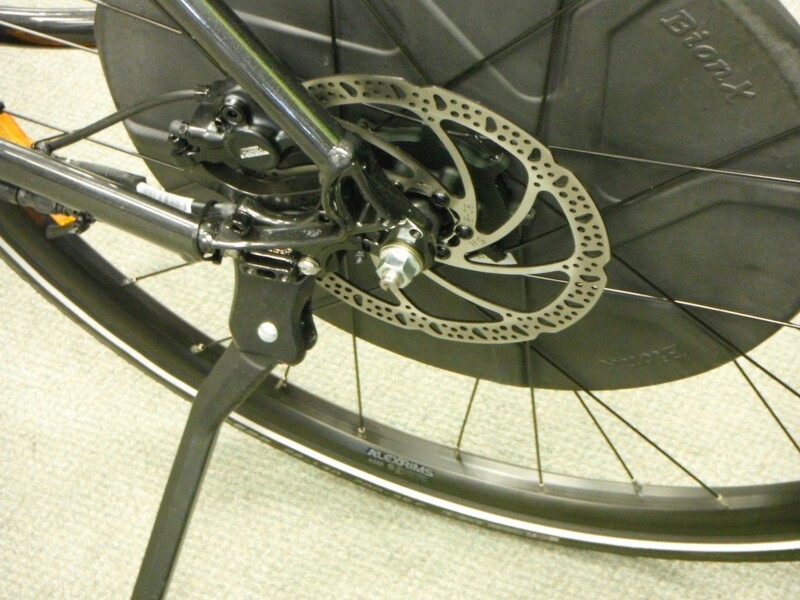 The bike itself features a Shimano 27 speed drivetrain with a Deore rear derailleur and Acera rapidfire shifters. The crankset is 28/38/48 teeth which makes for good speed and efficiency. A bonus is the pant guard to keep your trousers clean on the way to work. In addition to the regenerative braking that the Bionx system provides the HB1 is equipped with Tektro Hydraulic brakes for excellent stopping power. The alloy wheels are double walled for strength and have Schwable Marathon Green Guard (flat prevention) tires with reflective sidewalls. 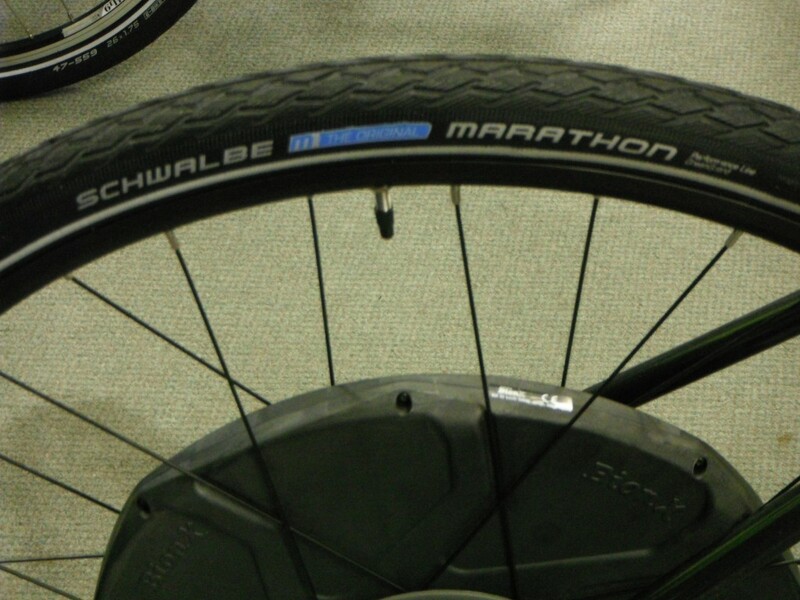 Schwable Marathon Green Guard tires with 3mm puncture protection. The HB1 features Tektro’s hydraulic disc brakes with the Bionx regenerative switch. The HB1 also has a built-in mount for the ebike kickstand that is included. The HB1 comes equipped with the 2016 Bionx 500w 48v D series kit. Assist levels are 35, 75, 150, and 300% of the power that the load sensor senses that you are putting into the pedals. BionX motors offer you powerful proportional electric assist in any situation, whether it’s a commute across town in the morning, or a weekend ride through the countryside. But did you know they can also act as a generator to help recharge your battery and boost your range? All BionX systems come with Regenerative Braking, so when you squeeze your bike’s brake lever, energy is sent back to the Li-Ion batteries, helping them recharge. And if you are traveling down a steep hill and want some extra braking, or want a greater workout as you pedal, switch the BionX system into one of the four Generate Mode levels. You’ll feel resistance, and even more energy is returned to the battery pack. The new distinctive design is noise and vibration free with generate/regenerative braking mode and proven strain gauge technology. The D-series motor is extremely sporty, lightweight and powerful – sticking to the principle, that an ebike has to ride and feel like a bicycle.